Vishu 2019 which is the Malayali New Year will be celebrated on April 15 this year. Vishu marks the beginning of the month of Medam, the first month in the Malayali calendar. Every year, Vishu is celebrated either on April 14 or April 15. People of Malayali community visit temples of Lord Krishna and Lord Vishnu and to have a Vishukkani Kazhcha (viewing). People enthusiastically celebrate the oncoming of a new year. Vishu Kani is one of the important aspects of the observances of this day. And every new beginning is also the time to spread good wishes among friends and family. 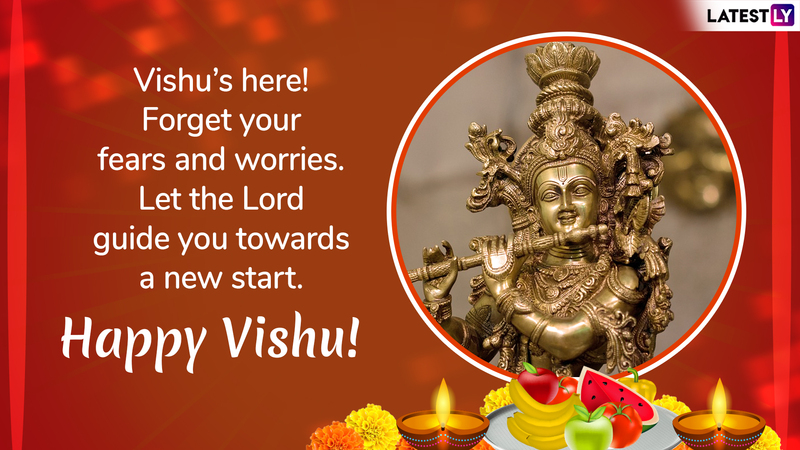 You can send special Vishu messages and greetings to wish on this auspicious day. 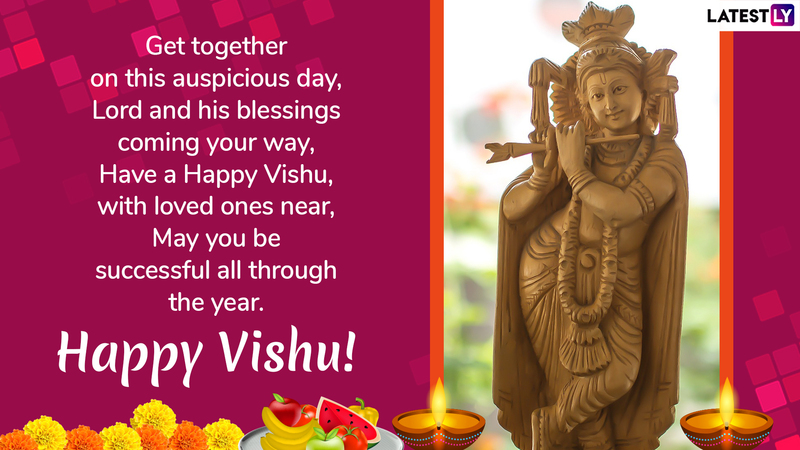 We give you lovely Vishu greetings, messages, GIFs and SMS with quotes which you can forward on this day. When is Vishu Sankranti? Date, Timing, Significance and Story of the Malayali New Year. 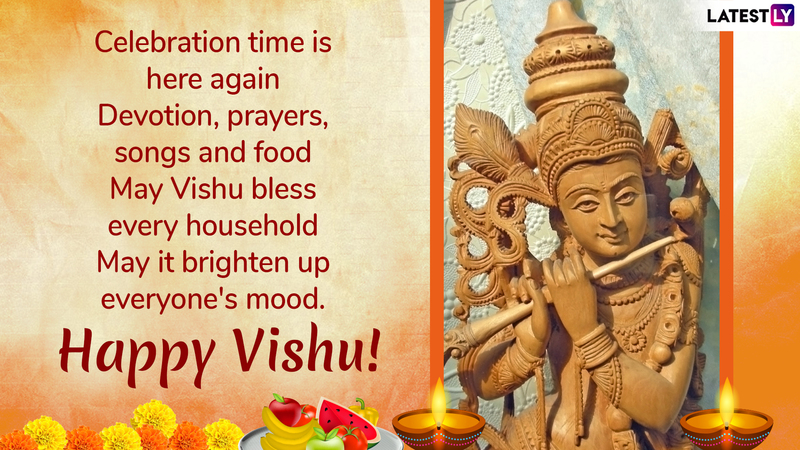 The word Vishu comes from the Sanskrit word "Vishuvam," which means equal day and night. People also worship the Sun god Surya on this day. It is believed that first sight on Vishu morning will determine how the rest of the year favours. So Malayalis ensure they wake up to the sight of Vishu Kazhcha on New Year’s dawn. Family gatherings and spreading good wishes is also a part of Vishu celebrations. 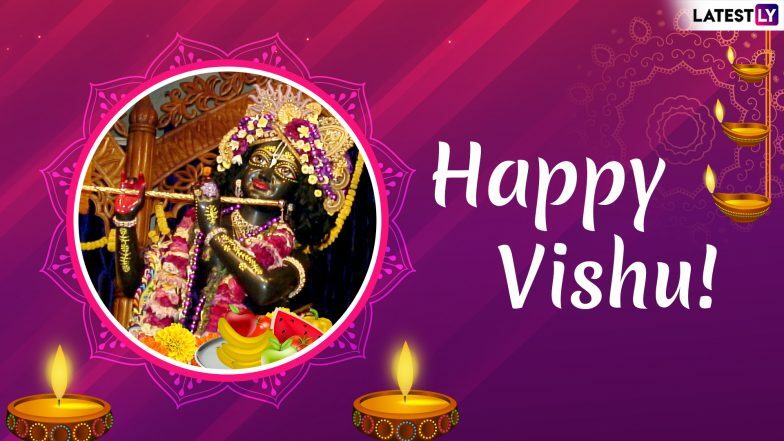 Given below is a collection of Vishu 2019 greetings and messages, GIF images, SMS and wishes to spread the cheer of new beginnings. Vishu 2019: How to Prepare Vishu Kani, From Krishna Idol to Grains, the List of Items To Include. Message reads: Get together on this auspicious day, Lord and his blessings coming your way, Have a Happy Vishu, with loved ones near, May you be successful all through the year. Message reads: Vishu’s here! Forget your fears and worries. Let the Lord guide you towards a new start. Happy Vishu! Message reads: On this Vishu wish you a plentiful year. May all your dreams and desires come true Happy Vishu! Message reads: Celebration time is here again Devotion, prayers, songs and food, May Vishu bless every household, May it brighten up everyone's mood. Happy Vishu. Message reads: Take a vow to bring goodness and joy in the lives of those who are close to us. Wish you a very happy Vishu! Message reads: It's time to spread love and wish for a new start. Wishing you a happy Vishu! If you want to send animated stickers, you can download special WhatsApp stickers for festive occasions. 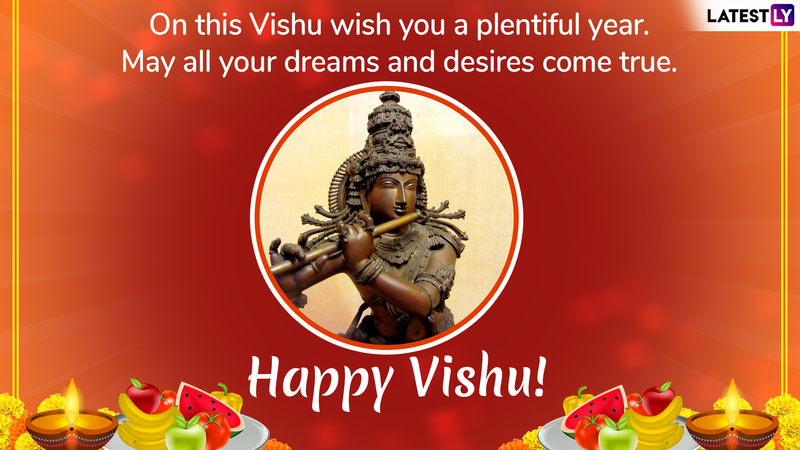 Download Vishu Sticker Greetings from festive sticker applications and send them through the application. If you want to wish your friends or family for Vishu 2019 with these stickers, you can download from Play Store. Vishu is an important day for Malayalis and we hope the above messages help you to send the greetings for the day. 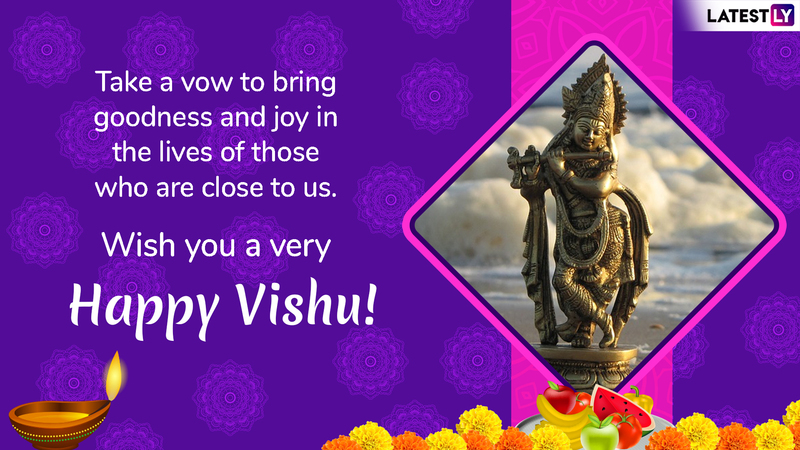 Wish you all a very Happy Vishu 2019!